With the bull Apostolicæ sedi of June 17, 1614, Pope Paul V Borghese promulgated the Rituale Romanum (Roman Ritual) four centuries ago. The Rituale is the penultimate liturgical book of the Tridentine Reform; in chronological order they are: the Roman Breviary of 1568; the Roman Missal of 1570; the Roman Martyrology of 1584; the Roman Pontifical of 1595; the Ceremonial of Bishops of 1600; the Monastic Breviary of 1612; the Roman Ritual of 1614; and the Octavarium of 1628. The Roman Ritual contains the ceremonies – apart from those of the Mass and Divine Office – which a priest may need to perform, such the administration of the Sacraments (Baptism, Marriage, Anointing of the Sick, Communion for the sick), funerals, and blessings. In the early centuries, the prayers for these functions are found most often in the Sacramentaries, which however did not describe the details of the ceremonies or give the relevant chants. When the Sacramentaries disappeared in the Middle Ages, to be replaced by Missals (which, in addition to the prayers of the Sacramentaries, contain the chants and readings of each Mass), there slowly developed as a parallel to the Missal a more-or-less complete manual to help priests perform the ceremonies apart from of the Mass which they might be called upon to celebrate. During the Middle Ages, this type of book multiplied widely. They existed a version for every diocese, or even for individual religious communities, with a great variety of names. So, for example, the diocese of Paris printed a Manuale Sacerdotum (Priests’ Manual) during the episcopacy of Jean Simon de Champigny in 1497. During the 16th century, certain Roman liturgists published three editions with the authority of the Pope himself. Published at Venice by the Dominican liturgist Alberto Castellani in 1523, this work was approved by Pope Leo X. The Roman character of the book is proclaimed by its title, “Sacerdotale juxta usum Sanctæ Romanæ Ecclesiæ”. (Priestly book according to the use of the Holy Roman Church) Castellani divided his material into three parts: Sacraments, blessings and processions; this will become the standard organization in subsequent Rituals. This was published at Rome in 1602 with the title Rituale Sacramentorum Romanum. In 1584, Pope Gregory XIII, the successor of St. Pius V, had commissioned Cardinal Santori to prepare a Ritual more in keeping with the requests of the Council of Trent, especially in regard to the administration of the Sacraments. After the Pope’s death the following year, Santori continued his work with the blessing of Sixtus V and of Clement VIII. In 1602, Cardinal Santori died, and his heirs then published his work. 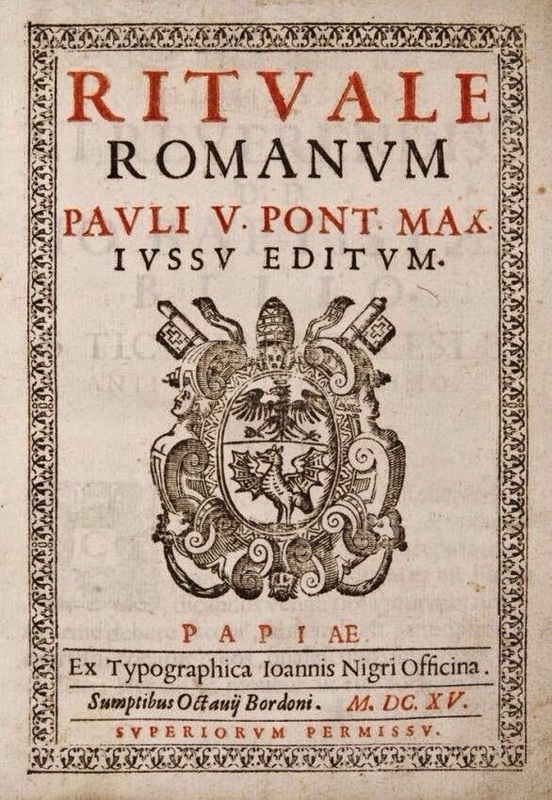 However, Pope Paul V (1605-1621) did not approve the works published by the heirs of Cardinal Santori as such, and preferred to publish another Rituale in 1614, while using many of the elements already present in Santori’s. The Ritual of Paul V adopts the organization of the material already present in the Sacerdotale of 1523: Sacraments, blessings, processions, in that order. It also adds, as we will see, a fourth part. The book presents first of all the administration of the Sacraments: Baptism, Confession, the Eucharist (and especially Viaticum), Extreme Unction. The seven Penitential Psalms and the Litany of the Saints – connected to Confession – form a link with the visitation of the sick, the Commendation of the Dying, funerals, the Office of the Dead, and the funeral of young children. The various sung parts of the funeral service and the Office of the Dead are noted in plain chant. After this digression, which goes from the treatment of the illness of the soul to that of the body, and from there to death, the Ritual ends the course of the sacramental life in a fairly droll, (not to say surprising) way, with marriage. There follows the part dedicated to blessings, beginning with the blessing of holy water before the principle Mass on Sunday. Among these are also certain blessings reserved to bishops which were not included in the Pontifical. Where chant pieces appear, they are printed out with the full notation. A third part is dedicated to the processions of Candlemass, Palm Sunday, the Major and Minor Litanies, and Corpus Christi, followed by those for special occasions, such as bad weather, wartime, a procession for thanksgiving, for the translation of relics, etc. The chants for these processions are also given. The book adds a fourth part containing various exorcisms, and ends with the formulas to be used when filling out a parish register. Paul V did not make his work obligatory, nor did he abolish other similar works in use at the time, or order anyone to use his. He simply published a model, from which diocesan editions might draw their inspiration. There continued to be many of the latter. Speaking only of France, in 1984 Jean-Baptiste Molin and Annick Aussedat-Minvielle counted no less than 2952 editions of various Rituals and Processionals. However, with the abandonment of the particular rites of dioceses over the course of the 19th century, and the adoption of the Roman Missal, the diocesans editions of the Rituals gradually passed out of use (the last in France seems to date to 1853) and the Roman Ritual was adopted everywhere. Because he wished to provide a work that would serve as a model for others, Paul V promulgated a fairly simple text, containing that which had long been standard practice more or less everywhere in the West. This rather minimal text left something to be desired. In the 17th century, we note here and there various printings of small supplements which are presented as if they if they were derived from the work of Paul V. I make particular note of the ancient ceremony for the solemn blessing of water on the vigil of the Epiphany, added to the Rituale Romanum in 19th century, an improvement made at the cost of a grave very badly executed mutilation of this venerable ceremony. Numerous new editions of the Ritual of 1614 were published, introducing changes of various sorts, generally enriching the part dedicated to blessings, and organizing the material better and with different titles. These were issued by Popes Benedict XIV in 1742, Bl. Pius IX in 1862), Leo XIII in 1884, Pius XI in 1925, and Pius XII in 1952. 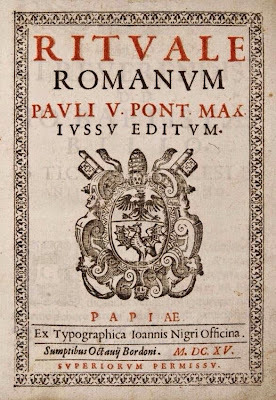 Despite the various editions, the text which has come down to us remains essentially the same, and the use of it remains authorized and protected by the motu proprio Summorum Pontificum of July 7, 2007, as we celebrate the 400th anniversary of its promulgation.